Brothers Bert and John Jacobs are “glass-half-full” guys, in spite of their tough upbringing in working-class Boston. It’s that kind of eternal optimism that led them to start their beloved Life is Good® brand. 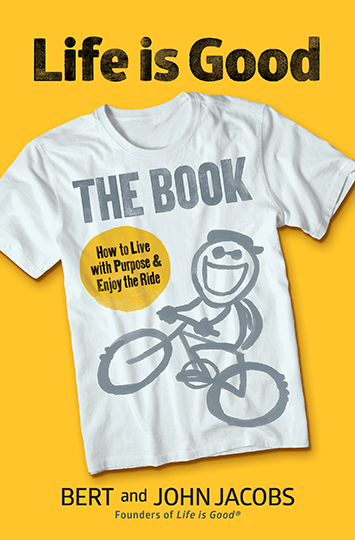 Now the brothers, whose clothing line and housewares grace millions of backs and shelves, are sharing the story of how optimism was the driving force to their success in LIFE IS GOOD: The Book: How to Live with Purpose and Enjoy the Ride. Their story is pretty amazing. Bert and John Jacobs always knew they wanted to start a business together that featured their artwork, but they never had much money. In the 1980s, they began designing T-shirts that they hawked on the streets of Boston. 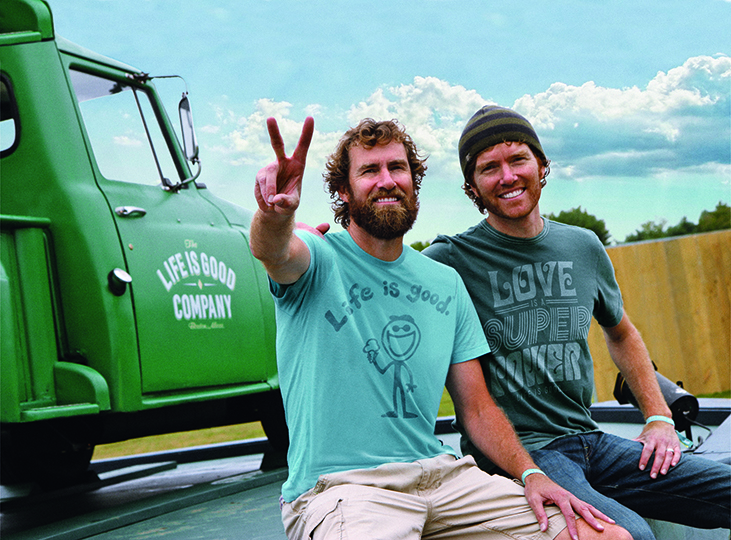 For five years, they drove their old van, which often doubled as their bedroom, to various East Coast colleges with stacks of T-shirts to sell. In those days, the brothers lived on peanut butter and jelly and “splurged” on occasional showers. At one point, when sales were dwindling and their combined net worth was just $78, the two considered giving up. But then they had an epiphany during a road trip. They realized that although there was so much bad news out there, the truth is that life is good. The rest is history — and $100 million ago. LIFE IS GOOD: The Book is Bert and John Jacobs’ vessel for sharing their philosophy and providing practical self-help to inspire and empower readers to embrace the good stuff. They learned that early in life from their mother, Joan, who was always positive — even in bad times. Every night she would say, “Tell me something good that happened today.” Now, the brothers put something similar out to readers by infusing the pages with inspirational quotations, poignant letters from the Life is Good community, lighthearted top-ten lists and other tips on how to live your best life. To live life with delight is within reach of everyone, they believe. In a way, we’re all super heroes — or at least have access to ten key “superpowers”: openness, courage, simplicity, humor, gratitude, fun, compassion, creativity, authenticity and love. Bert and John Jacobs show how to use them to overcome obstacles, embrace opportunities and take charge of our lives. LIFE IS GOOD: The Book is filled with examples that are both entertaining and profound, and are complemented by the Jacobs brothers’ iconic artwork. In telling their (almost) rags-to-riches story, the brothers highlight their experiences and show how focusing on the opportunities and optimism re-enforces something that studies have shown time and again. 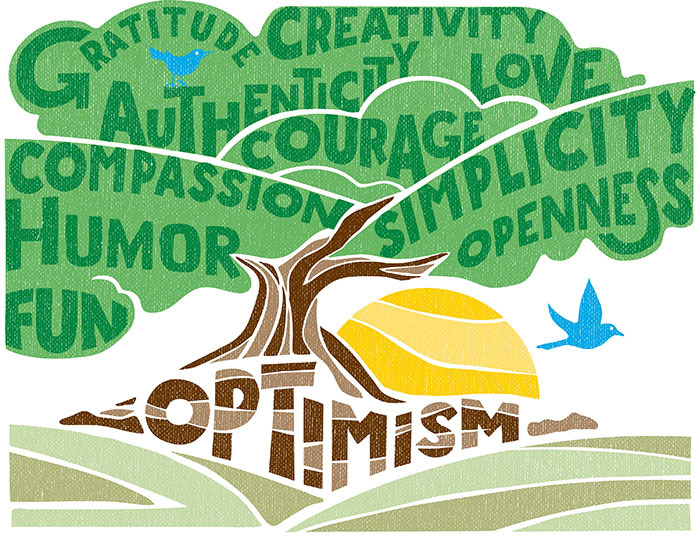 That is, that there is a strong link between optimism and increased mental and physical health, greater resilience in the face of stress and adversity, and an overall better quality of life.